A Water wheel (or Waterwheel) is a system for extracting usable power from the water flowing in a river or stream. Along with windmills, water wheels have being powering the milling of flour and other industry for hundreds of years. Waterwheels are still in common use in Nepal (25,000+), and India (over 200,000 waterwheels). Water wheels come in two main flavours: undershot, and overshot. Historically the undershot water wheel was the commonest as it is the cheaper and simpler to build. It was used frequently by the Romans and the undershot water wheel is sometimes known as a Vitruvian water wheel after the Roman engineer Vitruvius. In this system the wheel is simply placed over a fast flowing river. The water hits paddles which protrude all around the wheel and therefore turns the wheel. This system can only be used where the flow of water is very fast as little of the energy of the water (around 20%) is used. Click here to read our article on run of river hydro power. The overshot water wheel is more complicated, but much more efficient as almost all of the water flow is used for power. A dam and a pond or lake are built and used to channel water to just below the top of the wheel where it collects in buckets. The weight of the water in the buckets turns the wheel as the buckets on the other side are empty and therefore lighter. When a filled bucket has caused the wheel to rotate, and that bucket has reached the bottom of the wheel, it is inverted and the tail water falls out. That bucket the continues around the wheel empty until it gets back up to the top to be filled again. Around 70% of the energy carried by the water is used in an overshot waterwheel. Historically waterwheels were used to turn milling stones and other mechanical tasks. However they are now being reconsidered for the generation of electricity. A waterwheel for example has a lot less environmental impact than hyroelectric power generation since rivers do not need to be diverted, and the pressure of the water is not increased so fish are less likely to be injured or killed. The costs per Watt of power is £3 to £7.50 (according to Southampton University). Back in 2008 when we first published this article, the cost per Watt of solar photovoltaic cells per rated Watt was comparable, but at the time of updating this article (January 2014), the cost per Watt of solar panels has fallen below £1 per Watt. However, as a waterwheel can generate power reliably and predictably 24 hours per day, and generates the most power in the cooler winter and spring months when the most electricity is actually required, it still makes practical and economical sense to convert waterwheels to electricity generation. Click here to read our article Calculation of Hydro Power which enables you to work out the amount of power available to be exploited by a waterwheel. 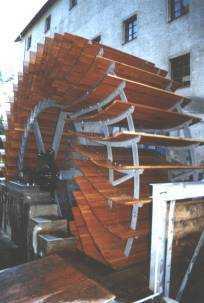 This article: Building a Waterwheel tells the story of a DIY waterwheel constructed in the UK for generating electricity, and this article: Electricity from Waterwheels has a little bit more information about the subject.